Earth Day is one of the great ideas of the new thinking that sprang from the 1960s. Starting April 22, 1970 Earth Day has been celebrated as a time to honor the Earth and our responsibility toward it. Earth Day is a very public attempt to educate people on the need to live within our resources and not at the expense of other life on the planet, nor at the expense of future generations. Part of the recognition of the fragility of Earth's life-supporting systems came from photos of the Earth taken by Apollo astronauts. Finally, humans were far enough away from home to see the planet in perspective - a little colorful sphere of life in the emptiness of space. Thus, the flag for Earth Day is based on the Apollo 17 full Earth view. To commemorate the Apollo 17 mission, the Visualization and Analysis Lab at NASA Goddard produced a lovely animations of lift-off from the Cape, flight to the Moon, and Earth-set over a lunar horizon. 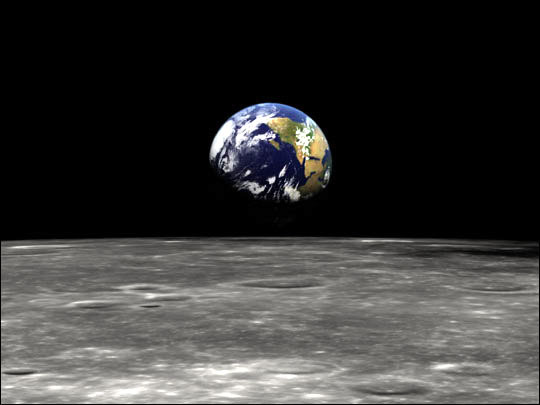 The image above is a still from the animation that also reflects the difference between Earth and Moon - and any other place in the cosmos that we know of. The Moon, the wonderful place some of us love, is grey and relatively inert, while the Earth is vibrant with the blue of water, the white of atmosphere and the green of chlorophyl enriched life. Happy Earth Day! This page was last modified on 23 April 2015, at 01:04.